I survived my first week back to work and I think my jet lag is finally gone! I don't have a lot on my plate this weekend, but I am totally ok with it. My sister's wedding dress came into the shop and we get to go try it on, purchase some accessories and start thinking about the bustle. I can't wait!! ONE. While I was away, I saw a Tom's ad for blush bow shoes and I knew I had to have them. They are similar to the mules I posted two weeks ago, but they have the full back and they are so pretty. Plus Tom's are so comfortable. I purchased them using some money I saved from my trip. Winning. TWO. I need some suggestions on your favorite thermometers. I have one that we got about 3 1/2 years ago at my baby shower and I feel like it doesn't work properly anymore. Our temperatures are always the same or within a few points of each other. Even when I know one of my kids had a fever (like when Sutton's cheek was infected), it didn't budge. She was still around 97 degrees. I have a few picked out on Amazon, but suggestions are welcome and needed. Speaking of Sutton, I wanted to give you all an update on her. Last I told you all, she got her stitches out and was looking good. Well the day I was leaving for my trip, she woke up with a ball of fluid coming out of her wound. I cleaned it and it immediately bubbled up again. I took pictures of the fluid on a cotton round, her face with the bubble of fluid and after cleaning it. I sent it to my mother-in-law (she is a nurse), Sutton's pediatrician and Rory (he was on his way to work). My MIL said she thought it was serous (normal fluid leaking), but since it was inflamed to take her into the pediatrician. I was supposed to have breakfast with the girls, but the planned changed. I dropped Avery off at daycare and headed to Sutton's pediatrician. We got there just as they opened and we didn't have to wait long before she was seen. They took the bandaid off (I put it on to not spread the fluid) and did a swab on it for a culture test. They assessed her wound, cleaned it and told us they thought it was infected and to start antibiotics immediately. Also she couldn't go to daycare that day. So I called Rory and he headed back up. They also said they thought she should see a plastic surgeon to have the wound assessed for scarring. I called a plastic surgeon at the airport and left a message. She called me back herself to talk about Sutton and see how she was doing. We set up an appointment for Thursday which Rory had to take her to. She has since finished her antibiotics and the plastic surgeon said to let it heal, start scar cream at 1 month (from when the accident happened) and then in a year we can do laser if it isn't to our liking. THREE. We just got information on the girls Valentine's Day party next week. I bought the girls Valentine's (Minnie Mouse) a couple weeks ago and even a few items for them on Valentine's Day. But now I have to prepare, ok buy, a few things for their party at school. There are 38 kids in their class (the class is split into threes and not everyone is full time) and I have the Valentine's covered. We also signed up to bring juice and a treat. 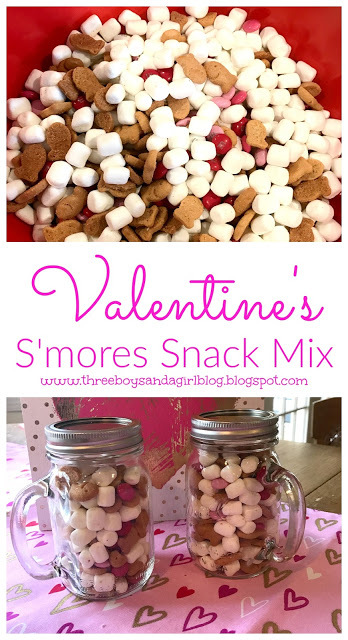 So I thought about what to make (not cookies since they are decorating them at school) and I immediately thought of Emily's S'mores Snack Mix for Valentine's Day. You can read her post here which is soooo simple. FOUR. Speaking of Valentine's Day, I saw the cutest book on amazon while looking at thermometers. It is called What I Love About Us. 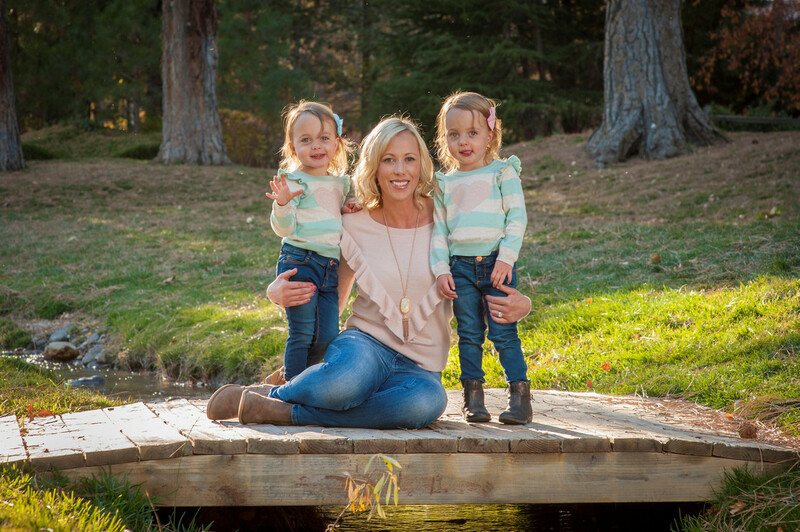 They have different variations like what I love about you, what I love about being your mom, what I love about dad, etc. It has 50 different prompts with things like I like how we make each other feel ......... and we'd make the best ....... team ever. I want to get this and give it to Rory. FIVE. 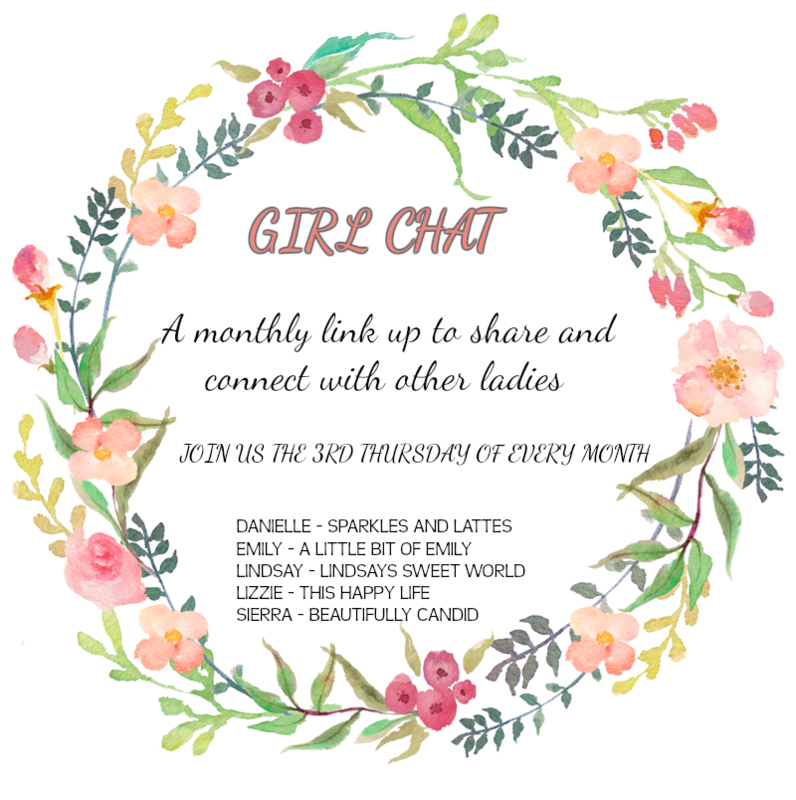 Don't forget, next week is our monthly link up for Girl Chat. 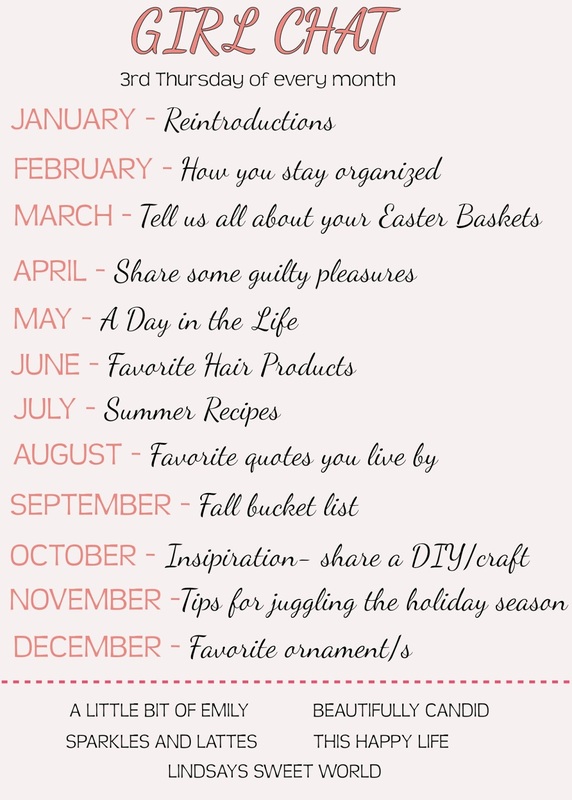 This month's theme/topic is How You Stay Organized. Im ao so sorry Suttons cut got infected but glad you got it taken care of and talked with a plastic surgeon! Sounds like she's well on her way to being healed! So funny you brought up that valentine's mix, I just bought the ingredients to make it yesterday. Such a yummy treat! I hope ya'll have a great weekend! I’ve made that Valentine’s Day mix before. It’s sooooo addicting! I keep seeing those Toms everywhere! Now I want spring to be here to wear them :-) Have a great weekend! We stick with the plain ole in the mouth one. The Toms looks cute, but man I have issues finding one that don't rub the top of my foot raw. What fabric is this? 38? I just have to deal with 16 kids, and it all has to be store bought. YEPPP - getting those shoes. Oh my word I feel you on those thermometers! My favorite is the behind the ear tap one, but it does vary. We have a hospital grade under tongue one but it's impossible to use correctly on a four-year-old. Basically when we went to the pediatrician this week, I just said he had a fever and I had no idea what it was. Gah. Also, I totally blogged about pink bow TOMS today, too! Great minds think alike!! I have the Braun no-touch thermometer. I think it works. Oh my goodness, I LOVE those Toms! I just copied you and totally bought them. Whoops! I don't have a favorite thermometer. In fact, we've struggled for over a year to find one we like. Let me know if you find a great one?! Ugh, what a rollercoaster with Sutton's poor wound -- it sounds like you have a good plan in place now. I LOVE those blush Toms! Amazing! Enjoy your weekend, momma. Those TOms are so darn cute!!! And that would fix my issue with all the mules being backless and looking ridiculous on my huge feet. That smore mix sounds delicious and I know the kiddos would love that. What a fun treat! Hopefully Sutton's wound heals nicely and you won't have to worry about the scaring in the end :) I Hope you all have a wonderful weekend! Those Toms are so cute! As is that book! Hope the scar cream helps with Sutton. I saw those TOMS as well and they are so so cute!!! Those Tom's are so cute!